If you are looking for fun yet easy 4th of July desserts, these red, white and blue jello shots will make a great addition to any Independence Day festivity. They are just the thing to add a little spark to your bash. First up we have three recipes created by the talented team at Jello Shots Test Kitchen, who are true experts at layering colors and creating stunning 4th of July jello shots. Red white and blue pudding is layered in a shot glass and topped with a scrumptious sugar cookie in the shape of a star. The whipped cream is optional but looks sensational. Learn how to make this stunning 4th of July dessert. Condensed milk and vodka add flavor and body to this creative 4th of July jello shot recipe. It's not only pretty but also fun to eat since it is served on a stick. Try this 4th of July jello shot recipe. This jello shot mold is perfect when you want to feed a large crowd without too much effort. It's the perfect red, white and blue dessert for your 4th of July feast! 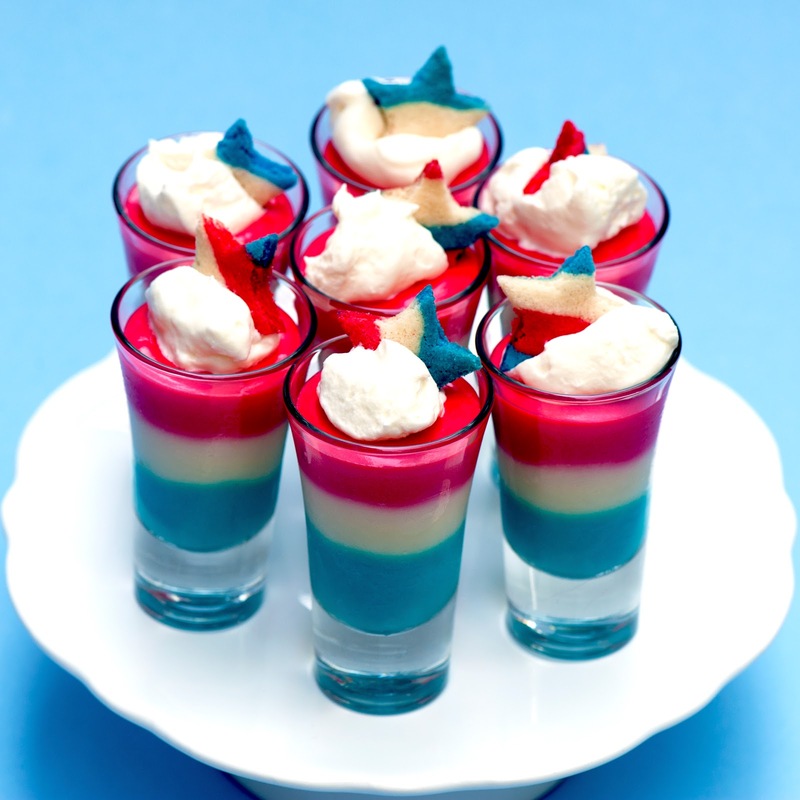 Honor Old Glory with these red, white and blue ''broken glass'' jello shots. They are mixed with vodka but rum would be a nice substitute. Find the recipe at A Palate for Pie. We love this idea from Tablespoon because it sneaks in some fruit into a 4th of July dessert. Try finding larger strawberries to make the process easier.